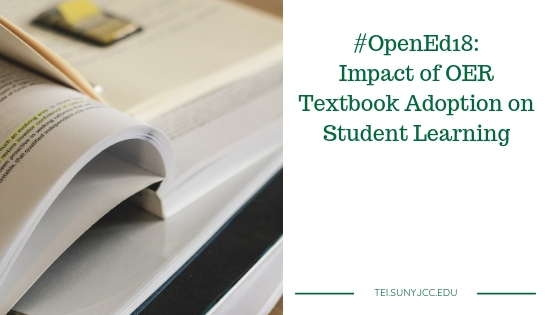 Debshila Basu Mallick, a postdoctoral research associate at OpenStax discussed the effect OER has on learning performance. She shared a study on the impact of remixing an open textbook. According to the research that Mallick shared, there are mixed results in learning performance for open textbook adoption and remixing. The researchers looked at three elements: access, quality, and remixing. Access – Having access to course materials should improve learning. Quality – Improving the quality of the content should yield better results. Remixing – Instructors can modify open textbooks. The degree of remixing should correlate to better performance. Mallick’s study focused on the remixing of a history OER textbook. The textbook was modified to accommodate a change to a course. A two-semester course was changed to a one-semester course. Course designers had to prioritize what would be included in the new course as well as what would be in the textbook. They reduced the open textbook from 32 chapters (975 pages) to 14 chapters (249 pages). As part of the remixing, they conducted readability studies to control for quality. The update edition had the same sentence length and word size. They also controlled for the course grade. They conducted comparisons on Pell Grant recipients, GPA, reading comprehension, etc. The research results indicated that the remixed OER content had no significant difference in learning.